This entry was posted in multimedia, video, Video cameras, Video storytelling, video tools, Workflow and tagged Sony EX-1, SxS, tapeless, video, Video cameras, videojournalism, XDCAM EX-1 by Colin Mulvany. Bookmark the permalink. Last week I got a chance to take a 5D Mark II (Production version) out on an assignment. Our Canon rep was visiting the paper for the day and had a prototype version on her, and then had the production version shipped to her at our paper that day. I’d like to think I’m one of just a handful of photographers in the news biz that have gotten to “kick the tires” of the new body. The video? It’s impressive. I love the new sensor on the camera and the light sensistivity, the limited DOF, etc.. Much of the praise that you have read or heard about it is true, and stunning when you get to experience it for yourself. Here are the cons that I realized in just a short period of having the camera..
– The camera is tough to use hand held. I shot with a monopod and with IS on the two lenses I had on me (70-200 IS & 24-105 IS)..
– You can’t monitor the audio off the camera (no headphone jack.) We had a Sennheiser MKE400 on the hotshoe for a mini-shotgun.. It worked really well.. But I felt like I was shooting blind in the aural sense. – The video files (h.264) are tough to play on even my Macbook Pro (2.4ghz/Dual Core).. To edit on the video, I had to do a transcode on it to another format in FCP, and then I could get the piece edited..
– Rep said 12 minutes of video was 4gb roughly.. I shot almost a 4gb card, with some still images/RAW as well.. I’d have to look back at the take to see what the data rate on it was. I know there was an option for 640×480 (D1) video. I’m not sure at this point I could do a quick turnaround on a video at an event or spot news.. Transcoding wasn’t quick and the video was too slow to work with before it. With all that being said.. I would love to have one of these cameras as a piece in my kit. I currently shoot with two 1D MKII-N’s, and a Sony HVR-V1U.. So that gives you an idea of where I’m coming from. The 5D Mark II would be a great second body as long as you didn’t need the motor drive, and the better AF performance. A few more things after I hit the submit..
– It’s hard to track someone and manually zoom and focus. Our still camera lenses just weren’t designed for that motion like on a film/video camera. – I noticed a little bit of that rolling shutter issue (just was looking at a clip) when I panned really fast in a scene.. The building stretched in the clip. If you have any other questions, place them here and I’ll try to answer them from what I know! A big thanks Matt for the info. It seems we are treating the 5D Mark II like the second coming. My biggest beef with these type of cameras is that you still have to figure out how to edit the files in a program like Final Cut. All this transcoding is time consuming. The XDCAM EX-1 does it in a way that makes it simple. I believe it puts a .mp4 wrapper on the file thus making is easy for Final cut to read and edit the file. The files are still huge, but my MacBook Pro handles it just fine. Cameras like the 5D are going to have a place at newspapers. But there present limitations are not going to make the bigger, full-featured cameras like your V1U or my XDCAM go out of fashion for some time. hey colin, check out this link. you can use SDHC cards in the ex1. Being a member of the “frame-grab crowd,” I’d love to see a real-world sample out of your camera if you ever get a chance. We publish Z1U frames all the time, but the interlacing is always a pain. Could you post a frame if you get a chance? Colin — I’m with Peter.. We do occasionally use frame grabs from our Z1U’s and V1U’s.. I’d love to see some examples from it. I am envious of your EX-1, though I really like the size of my V1U. I’d love to quit using Firestores!!!! I hate dealing with them, but they help on quick turnarounds. 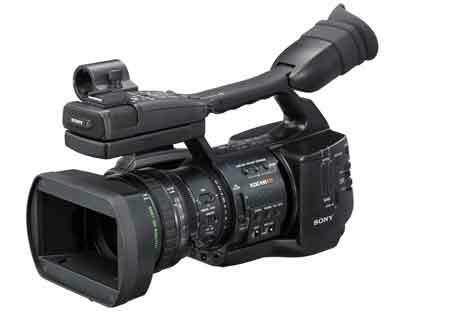 I’ve had my eye on the Sony Z7U. It also offers progressive mode and records to Flash Cards (plus tape simultaneously). It also has an interchangeable lens system. Do you think the EX-1 would be a better choice? If so, why? Angela, It’s the weird files that come out of the Sony Z7U that made me nervous. Nobody could tell me if or how they work with Final Cut Pro. If the conversion time is real-time , then I would rather just stick with tape. Oh, that’s a good thing to consider! Back in 2005 someone posted about problems importing M2T video from a Firestore … Someone responded that he could use a program called MPEGstreamclip to convert the M2T to MOV. Here’s a useful site I’ll probably experiment with before making my final decision. It allows you to download M2T video clips and experiment for yourself to see if they work with your editor. Finally, the most helpful link I found: Sony created a FCP plugin specifically for editing M2T files from the Sony Z7U. Here’s an even better discussion on this topic.